The label’s Resort 2017 collection says it’s time to sit up and listen. You know that feeling you get when you haven’t seen someone for years, and then you bump into them on the street and suddenly they’re all grown up? That’s Aje. Adrian Norris and Edwina Robinson launched their label almost a decade ago in Queensland. Since then, one store has turned into 27 stockists, nine stand alone stores across Australia and Aje has been accepted into the Australian Fashion Chamber. 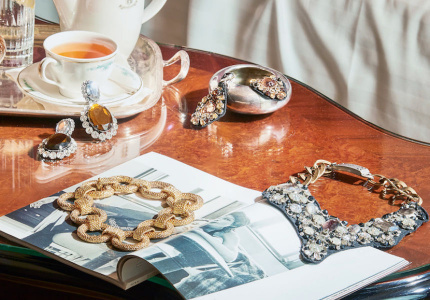 The AFC will be taking Aje to New York – alongside other local designers – to present during Resort season in June, as well as Paris in September. But it is the latest collection, Awelye, which shows the label has clearly emerged from its infancy and come into its own. 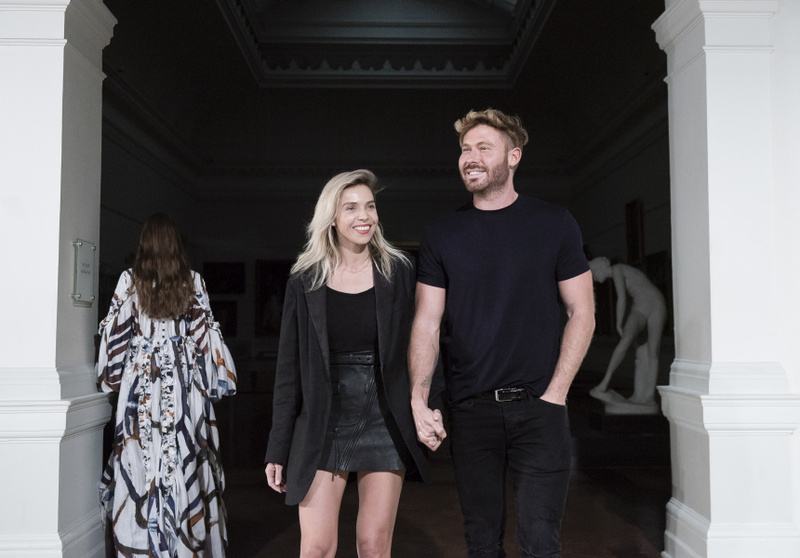 Aje showed its Awelye Resort 17 collection in a powerful presentation at the Art Gallery of NSW on May 4. Australia’s most important Indigenous artist, Minnie Pwerle, was the muse behind the design. By placing themselves and their clothing in the context of an art gallery, the designers asked that their work be taken seriously as a form of cultural expression. Norris and Robinson also travelled to the late artist’s land in the Utopia region of the Northern Territory to produce a film to accompany the collection. The collection, developed over nine months, features one-shoulder dresses in abstract prints, nipped in at the waist. 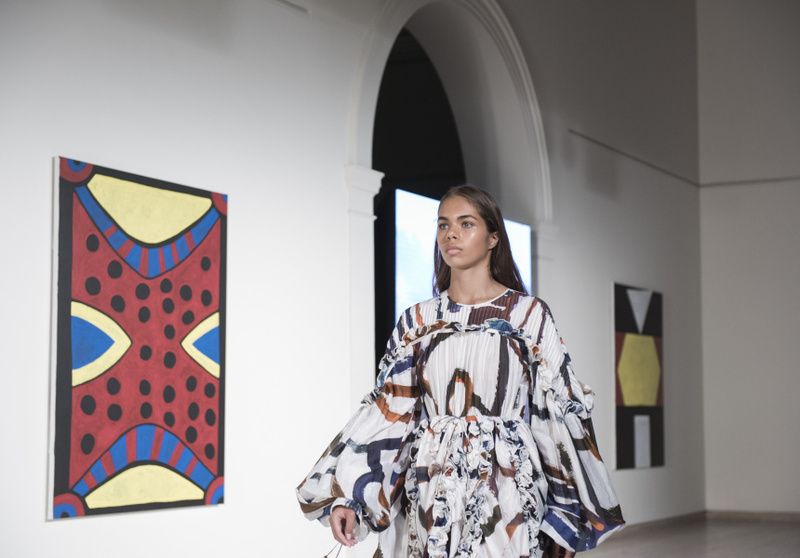 In the show, models strode down the runway with Aboriginal artwork hanging on the walls beside them. There were flouncy dresses with oversized, statement sleeves, and furry mini skirts and feathered tops with shoestring straps, signalling a newfound sophistication. The label has moved beyond its trademark sequined t-shirts and mirrored mini-skirts, with more complex and sophisticated designs. 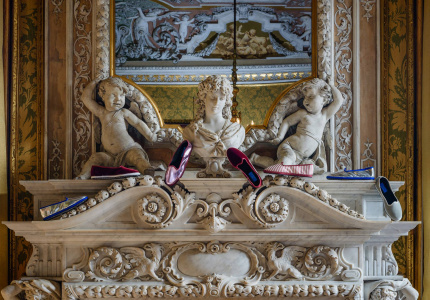 It has also immersed itself in cross-cultural conversations between art and fashion. “Our primary focus over the last three years was concentrating on opening stores and commercialising. Now is a really nice time – we know what works and what the customer wants,” Robinson says. Leaving the Myer family behind after two years, Aje will be stocked in David Jones from July this year. Robinson feels there’s more opportunity for growth there, and that the department store offers a more “elevated setting” with similar fashion peers. With that in mind, Robinson already has her eye on the next collection. Aweyle will be available in stores from October this year.